As I opined in my last post, the very fact that I'd even attempt something like a cod cake is testament to the virtues of Mark Bittman's brilliant "How to Cook Everything." They're really not too hard, but you need to have the correct ingredients, and you need to have a standard of calm and quiet in the home so you can concentrate. There are several steps you can trip up on. I'm finding that a primary problem of mine is pressure. I tend to announce my intentions of cooking for another, and that's when I choke. I have a big problem cooking for people. Not my kids. They don't count. In fact they'd be happier if I stopped cooking for them altogether and just fed them breakfast cereal for dinner. I mean other people. Friends. Tony. My Dad. Those close to me who, like anyone, are delighted to accept the offer of a meal and probably expect a taste sensation or at least something edible put before them on a nice plate. I have the nice plates. It's the edible, tasty part that I can't promise. I don't remember why we were talking cod cakes, but about a month back I got it in my head to cook up a batch again. I haven't made cod cakes since I left Berkeley in 2003. "Oh, I can make a mean cod cake," I bragged to Tony one night, dimly remembering my one or two dumb-luck successes. "You'd love my cod cakes." Before I knew it I was on the docket for that Friday night. Dinner at home. Cod Cakes on the menu. The first order of business was getting the salt cod. Back in Berkeley I had access to the famous Berkeley Bowl, with its six different kinds of organic endive and 34 varieties of peaches. It sold small loafs of salt cod in a shrink-wrapped package in the freezer section. All you had to do was soak it overnight; change the water three or four times, and by the next afternoon you had cod ready to cut up and cook. All I have now is a Whole Foods, which is like Berkeley Bowl's skinnier, better-married sister. It's got half the stuff at twice the price but it sure looks prettier. It has salt cod, but it's flat, unpackaged, and kept in a barrel, I suppose to preserve its rustic feel. I supposed they would fill out upon soaking. I had Tony bring down three fillets later that week. The big day came and typically I wasted time drinking wine and dancing around until it was 5 and time to start dinner for the kids. I put pasta on for them and started the potatoes. For cod cakes, you mix the cod with mashed potatoes, dredge in bread crumbs and then fry. First mine-field: Make mashed potatoes. The Bon Appetit magazine I get (but still don't know why) had a Thanksgiving special section that included an article called "Mastering Mashed Potatoes." It promised a four-step process to perfect mashed potatoes. "What's the secret to light and buttery mashed potatoes? It's all about using the right techniques in the right order." I can read. I can follow a simple to-do list. So I figured I should be OK. I boiled the potatoes for the prescribed time. I "dried them out" by stirring them in the saucepan for "about two minutes," per the instructions. I added the butter. Finally, I mixed in the liquid. The instructions said the milk must be warm so that the potatoes don't become gummy or cold. Check. What it didn't mention was that you need to pour the milk in a little at a time. I only remembered this after dumping in all the milk at once. So I had fairly runny mashed potatoes. So much for fool-proof techniques. Bon Appetit should hire me to stupid-proof all their recipes. Next step. The Cod. Unfortunately, the salt cod floating in water in my refrigerator had not lived up to its promise. I pulled off the skin and was left with two thin flaps of rubbery fish. I cooked it in hot water, which only made it more rubbery. I cut up what I had as best I could and mixed it with my mashed potatoes. Third step: Dredge in bread crumbs. Because I am detail-challenged, I hadn't bought bread crumbs. I ran out to the store and found some stuff called Panko, Japanese-style bread crumbs. These actually worked great because they're bigger than standard bread crumbs. Fourth Step: Fry up. Frying is dicey. I don't eat a lot of fried foods and the very act of dumping half my olive oil into a pan caused me great pause, not to mention eye-twitching. I wondered if I shouldn't be using another sort of oil that might pair better with fish, but such instruction was not noted in the recipe. The frying went off without incident, but throughout the entire cooking process I was vexed by constant fear of failure, anxiety over how I could save face if the meal went horribly awry and Tony was forced to call out for Chinese instead. I felt I didn't dare improvise, such as take a chance with a different cooking oil, for fear I would ruin everything. As it was, with the sloppy mashies and the disappointing cod, I didn't know how things would turn out until I took my first bite. Tony arrived, bearing Manchego cheese, olives and bread from our favorite place in the world, Say Cheese in Silverlake. My kitchen looked like Hurricane Katrina had stopped by for a quick bite. He set out the goodies and I fell on them without a thought to etiquette, sitting there in my stained apron. 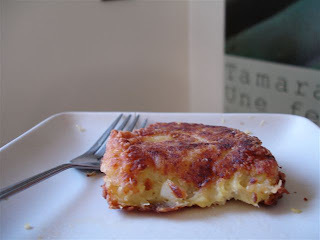 When I recovered my senses, I served up the cod cakes without garnish, and realized that I'd failed on the fifth step as well: You can't serve a dish in a vacuum. The cod cakes tasted fine, but I'd prepared nothing to go with them. They became simply another appetizer. Only they'd taken a lot out of me. Tony seemed to understand. He poured me a big glass of wine and ate his cod cake con mucho gusto, singing its praises with his mouth full. I agree that they were edible, but with better cod and a thicker potato they could be so much more. I was once again reminded that learning how to cook was very much like learning how to dance flamenco: You have to learn the steps before you can concern yourself with artistry. And so with me you get a cod cake on a plate. But you don't get the meal.